Anglers Quest/LHAC This Sat 1/13 - Lake Houston Fishing! I think I only see UCBM on here as a tourney fisherman. In an attempt to get some more traffic on here, lets maybe post some result after the monthlys going forward. Unless this is against forum rules. I fished one two years ago in Jan, about the same conditions as tomorrow will be, but with a lite mist all day but still real cold. Hope they hit 'em. I aint that mad at them myself! angler quest or other tournaments on lake Houston. I may or may not fish it this year, partner moved away and having trouble finding another one. I will post them then if you allow it. I AM INTERESTED PLEASE DO, LOOKING FORWARD TO IT PLEASE. Tough Day for me. North end of lake including East and West Fork as well as bayou muddy. Water temps ranged from 46-50 degrees today. We had 26 boats in the club tourney and I think 17 or so in AQ. Some teams fished both so probably somewhere between 35-40 total boats. Several teams blanked including me and it only took a little over 2lbs to get a check. I fished solo and just couldn't get anything going. Daniel and his partner Hugh had a little over 8lbs but not sure what place they came in. It was 29 degrees at launch time and we all had ice building up in the rod eyes. First time that happened to me on LH. Expect to bounce back in February. many of them and not really a fun day especially with a little drizzle rain. to stop today. would think the red traps in that mud . Did a lot of rding today. Believe I saw you UCB on Easy Fork pulling into that pocket by East End Park. Ran into several working the shallow cypress hard flipping jigs but didnt see any fish come out. 26 is a great # in this weather, does that mean 50 in Mar/Apr? 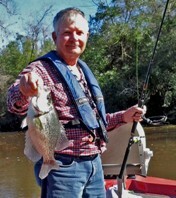 I have seen Daniel/ Hugh every time I have been out crappie fishing. Proves you dont need a 70K rig to compete!!! Member's Name / Team	# of Fish	Total lbs. Tim and John won AQ with same weight but she has not posted her results. What does it take to get in on these tourneys? Same question for me regarding the Lake Houston Club Tourneys. Tim Neuman is president of LHAC, and the tourneys are 2nd Sat of the month. They always have a pre tourney meeting the Tue before and Lake Houston Marina, 7pm, stop in, pay membership fee and entry, then show up the next Sat morning and get after it. Cant tell you much about AQ but sure it some type of membership fee, about all I know.